The Ports-to-Plains Alliance hopes you had a great Christmas and New Years. 2019 will be a great year! With the Ports-to-Plains Alliance Board of Directors setting the priority to obtain designation as a future interstate for the extension of Interstate 27, the Alliance is calling for support for this designation. This newsletter will focus on providing background on the extension of Interstate 27 and on the designation itself, including process and benefits. Please contact Joe Kiely, Vice President of Operations or Duffy Hinkle, Vice President of Membership and Marketing with questions. We are a voice for our small town, grassroots members who may otherwise not have access to the right audiences, as well as a conduit for industry to come together in support and promotion of transportation improvements. What Can You and Your Community Do? Interstate 27 currently exists between Amarillo and Lubbock in Texas. Interstate 27 was not part of the original Interstate Highway System chosen in the 1950's but was authorized with the Federal-Aid Highway Act of 1968. H. Mahon, member of the U.S. House of Representatives from 1935 to 1979 and chairman of the House Appropriations Committee after 1964, helped secure funding for the road. Texas officially designated the highway in early 1969. The final section of I-27 built was through Lubbock, and was completed on September 3, 1992. The Ports-to-Plains Alliance first initiated discussion about the potential of an extension of Interstate 27 along the Ports-to-Plains Corridor in 2014. This led to Texas Department of Transportation's Initial Assessment Report: Extension of I-27/Ports-to-Plains Corridor published in November 2015. Click Here to Download the Initial Assessment Report. 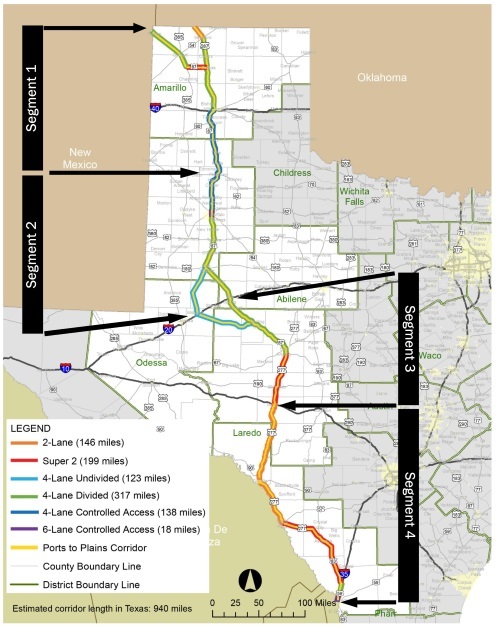 The Initial Assessment Report, assessed the Ports-to-Plains Corridor in Texas for 1) existing conditions; 2) potential upgrade options; 3) a summary of public outreach and reaction; and, 4) potential next steps for TxDOT to consider toward further planning, public outreach and corridor development, using four segments (see graphic). 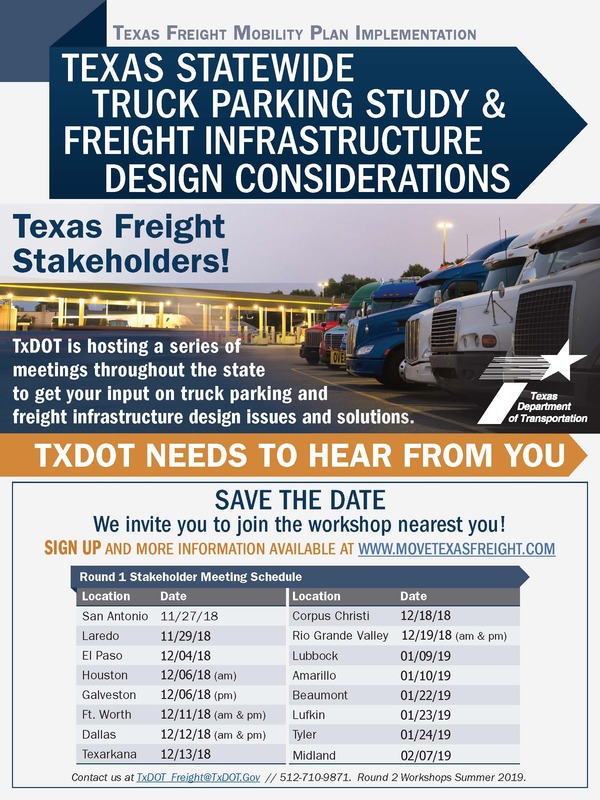 In the larger statewide freight planning effort, the Texas Freight Mobility Plan, November 2017, identified the I-27 Extension from Lubbock to Laredo as one of two Strategic Freight Projects for Texas. 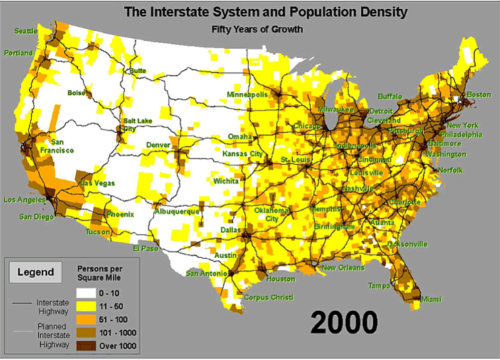 Future Interstate Designation is a federal designation which identifies certain High Priority Corridors as future components of the Interstate Highway System. 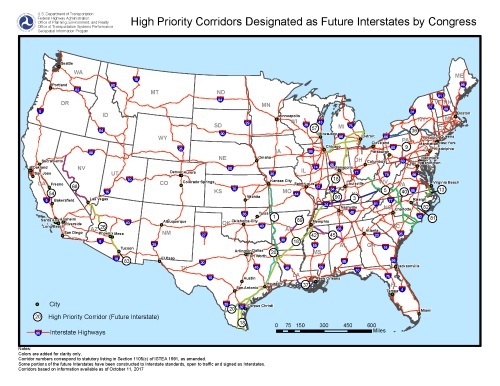 To date, all or a portion of twenty-two (22) or twenty-five percent (25%) of the High Priority Corridors have a Future Interstate Highway Designation. The Ports-to-Plains Alliance includes three High Priority Corridors on the National Highway System: Corridor No. 14 - Heartland Expressway; Ports-to-Plains Alliance - Corridor No. 38; and Corridor No. 58 – Theodore Roosevelt Expressway. Federal law allows Future Interstate Designation for existing High Priority Corridors on the National Highway System by either administrative action of the Federal Highway Administration (FHWA) or congressional action. The administrative process requires each segment designated must have an approved final environmental document covering the route and project action must be ready to proceed with design at the time of designation and the state(s) must make a commitment to complete the highway to Interstate design standards within twenty-five (25) years from the designation as a future Interstate. The Board of Directors has chosen the congressional process. Designation as a Future Interstate under the congressional process requires no specific timeline nor financial commitment by the state(s). The project can continue to develop with available funding without arbitrary deadlines which might prove difficult for states to support. This would allow states to continue to develop the corridor as they have in the past. As an example, when Ports-to-Plains was designated as a High Priority Corridor on the National Highway System there was no specific timeline or financial commitment by the state departments of transportation. The Ports-to-Plains Corridor, since designation as a High Priority Corridor, has seen over $2.5 billion in state and federal investment including over $0.95 billion in Texas. Future Interstate Designation will continue to allow the corridor to be developed incrementally as in the past but will limit the need to reconstruct to a different standard in the future. Investments will be made with the interstate standard in mind as designs are completed. Ports-to-Plains Alliance Board of Directors has identified a priority of obtaining Designation as a Future Interstate for the extension of Interstate 27 between Lubbock and Laredo, Texas. This priority was identified because of various reasons including the levels of trade between Texas and Mexico, the importance of energy production to the Texas and U.S. economy and the strategic priority of this segment identified within the Texas Freight Mobility Plan. The Board of Directors also established a priority of continuing to advocate expansion of the entire Alliance corridor between Mexico and Canada. This includes the historical advocacy at state and federal levels for four-lane or better expansion. Defense - "the appalling inadequacies to meet the demands of catastrophe or defense, should an atomic war come"
The future interstate designation today of any of the proposed options would serve the same purposes. 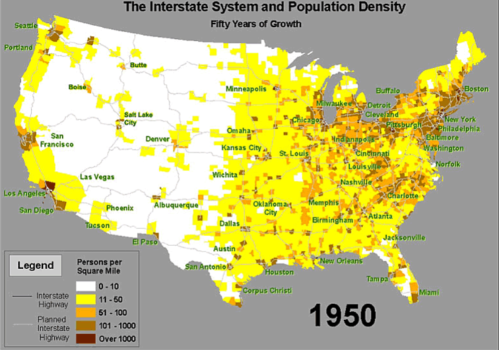 If feasibility studies were required before the original interstate system was built, the historical data would not have resulted in a positive feasibility. 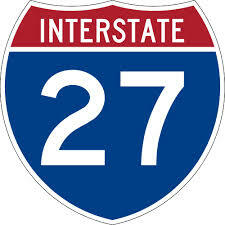 Having support from you, your community and its elected officials, your MPOs, your state DOT and your congressional delegation will be the key to success of this effort to designate an extension of Interstate 27 as a future interstate. Download Draft Resolution (Please send executed resolutions to Joe Kiely at joe.kiely@portstoplains.com.